Reprinted with permission from Sharon Lee Tegler of the Capital Gazette. Read the article in its original location here. 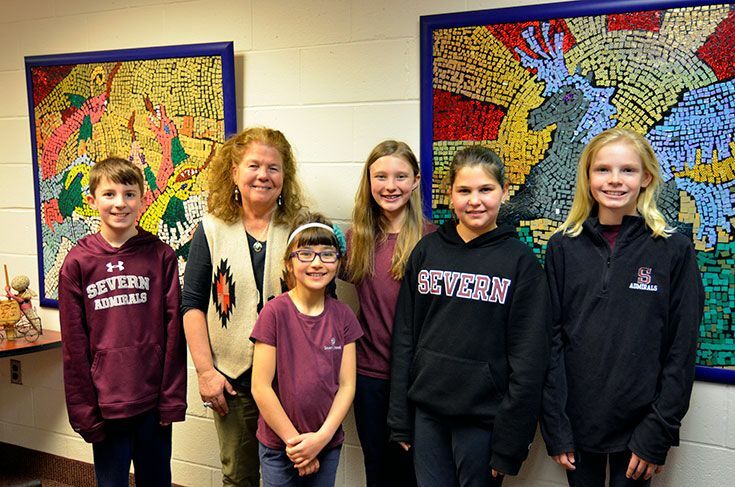 Fourth-graders gathered in the media center at Severn's Lower School on March 29 were fascinated by children's book author Karen Lynn Williams' talk and advice. They'd been studying how to write and illustrate a book with media/arts teacher Pilar Okeson and were well-prepared. Williams, who has 14 children's books to her credit, has also penned a mystery, a book of poems and several other works. She's spent extensive time living abroad with her husband Peter, a doctor. In Malawi, Africa, she taught at a school for the deaf while volunteering with the Peace Corps. From 1990 to 1993, she lived in Deschapelles, Haiti, and volunteered at the Hôpital Albert Schweitzer. She now lives on the Navajo reservation in Chinle, Arizona, and teaches online graduate writing programs at Seton Hill University and Chatham University. Williams' visit to Severn on March 29 was sponsored by The Birney Fund and designed as a cross-curriculum event with an ambitious schedule. Author Karen Williams reads an excerpt from "Galimoto" during her morning presentations. 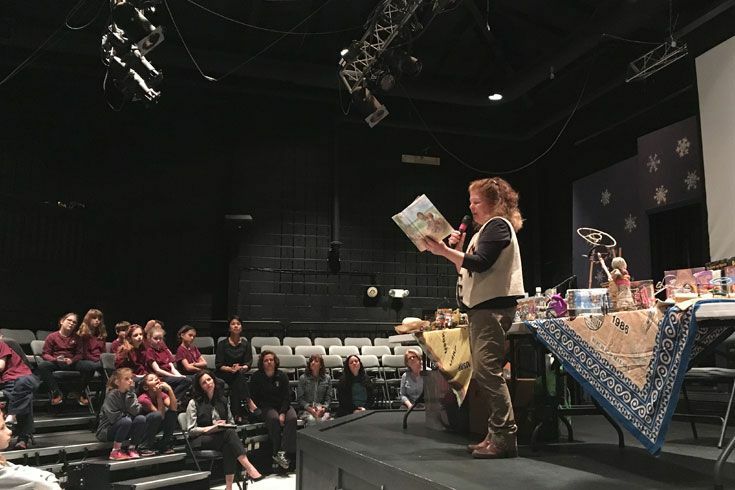 At 8:30 a.m., she spoke to third-, fourth- and fifth-graders about relating cultural aspects of the countries she's lived in through her books. Mid-morning visits with pre-kindergarten and kindergarten children were focused on kids' toys from Africa and Haiti including one illustrated in her picture book "Galimoto." 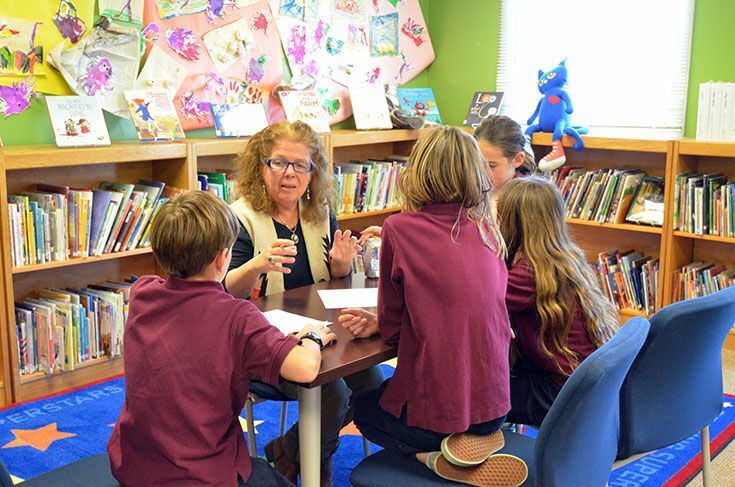 Lunch was spent with "Battle of the Books" participants and followed by 10-minute back-to-back writer's workshops for fourth-grade students who'd brought samples of their own book-writing/illustration projects. Because Williams is not an illustrator, she began each session by sharing stories about how she works with publishers and the artists they chose to illustrate her books. Using "Galimoto" as an example, along with artwork and storyboards loaned by illustrator, Catherine Stock, she demonstrated how the artist's vibrant watercolors came together with her text to tell a powerful story about African village life. She said working with Stock or other illustrators assigned by her publishers sometimes produces unexpected results that don't align with her vision but nevertheless enhance a story. She ended by describing her collaboration with photographer Wendy Stone on a children's book called "Beatrice's Dream" about life in Kenya. The writing workshops for small groups of children followed at a table at the back of the media center. 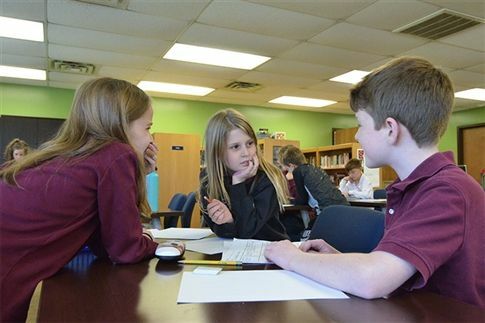 Okeson said this year's book writing project involved two classrooms of fourth-graders. One class was tasked with writing the text while the second class was responsible for creating the illustrations. They'll eventually come together to complete the project. Later on, they'll revive the project swapping assignments. The kids were divided into working groups of four. Severn 4th graders are eager to hear Williams' advice on writing and working with an illustrator. From the expressions on their faces, it was clear that the 9-year-olds were excited to have their work critiqued by a professional writer. When Davis Mann, Rebecca Hill, Finn Fries and Stella Garcia, from the first group, sat opposite her, they were nervous but she put them at ease. Davis was asked to read the group's story aloud and, afterward, the students enthusiastically traded questions and comments with Williams and eagerly adopted her suggestions about wording and picture placement. Reagan Mahan and Holland Sixbey, from the second group, seemed particularly interested in the author's comments about the need to simplify and condense their text due to space restrictions. They also liked her suggestion about including extra words as comments in dialogue balloons within illustrations. While subsequent groups came and went, another project related to Williams' book "Galimoto" was going on in the school's technology lab. Technology teacher Sam Mendez said the fifth-graders were making their own galimotos. He described them as push-toy vehicles made from wire, scraps and discarded objects that are popular with children living in the African Republic of Malawi. Galimoto designs can be very intricate and imaginative. The versions being made by the Severn students were on a smaller scale and built with wire and recycled items brought from home like shoeboxes, cracker boxes, yogurt cups, milk cartons and empty paper towel rolls. 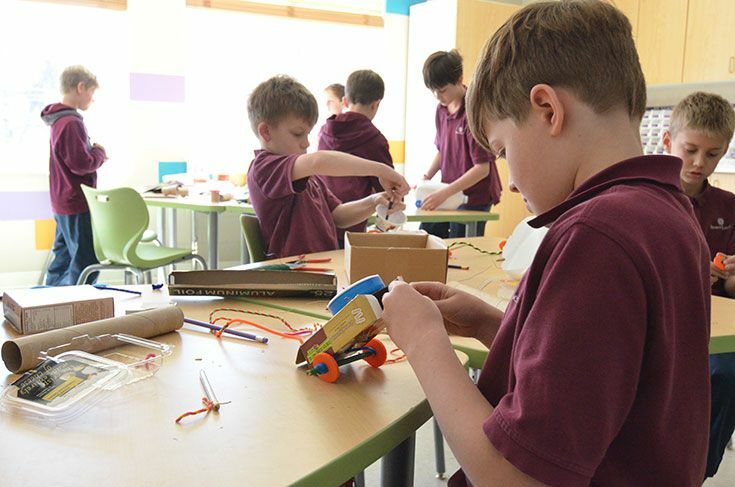 Focused on their creations Severn 5th graders make galimotos similar to those described in Williams' book. Additional activities planned around Williams' books and visit included learning African folk songs, creating sand art, playing games from other cultures, and learning and writing about life in a slum like the one in "Beatrice's Dream."